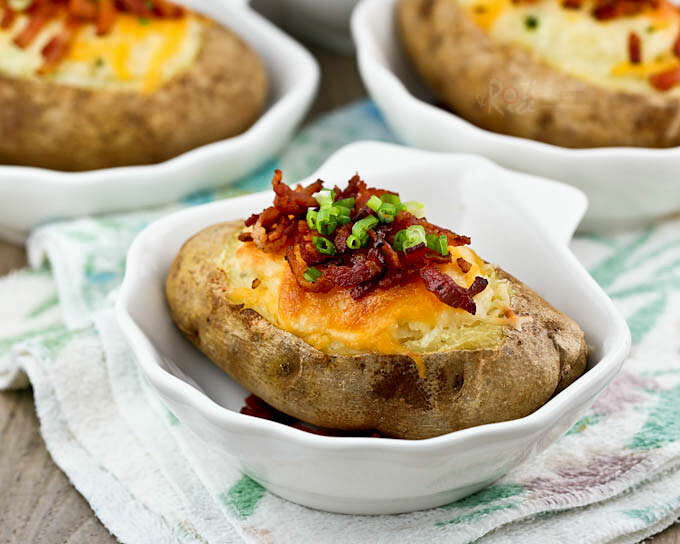 Cooking anything twice may seem like a lot of work but I assure you these Twice Baked Potatoes are totally worth the effort. The insides are deliciously moist and creamy while the toppings provide a tasty crunchy contrast. Depending on the size of the potato, it can be served as a side dish or as a stand alone lunch. I would be quite happy and satisfied eating one of these spuds with a bowl of soup for my lunch. 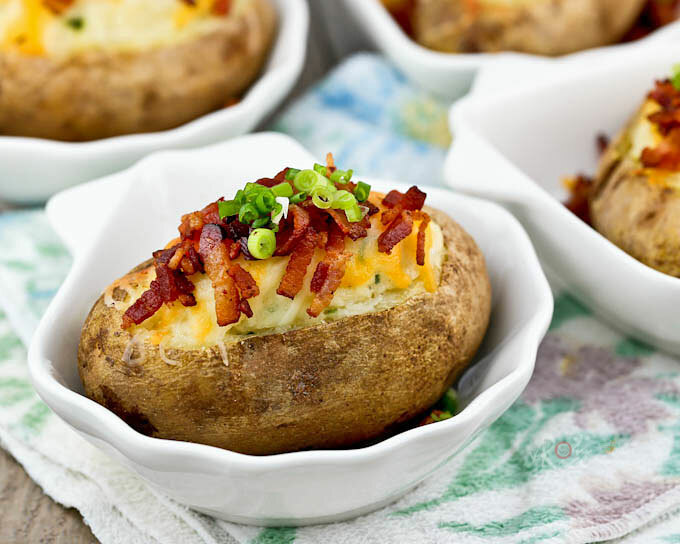 Twice Baked Potatoes are basically mashed potatoes stuffed into baked potato shells. The hardest part of the preparation is the hollowing out of the potatoes. You want to leave a thick enough layer of potato in there for it to hold its shape. Once that is achieved, the rest of the preparation is really easy. Do give it a try. Scrub baking potatoes. Pat dry with paper towels. 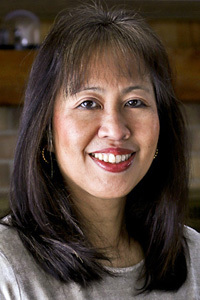 Place on a baking tray and roast in a 375˚F (190˚C) oven for 1 hour 15 minutes. Remove potatoes from oven. When cool enough to handle, cut off about ½ inch lengthwise from the top of each potato. Carefully scoop out the flesh into a mixing bowl, leaving ½ inch of the perimeter intact. Add salt, pepper, sour cream, and mustard to the bowl. Mash potatoes until all ingredients are well combined. Add green onions, reserving a tablespoon for use later. Gently mix to incorporate. Refill the potato shells with the potato mixture, mounding it slightly. Place each potato on individual oven proof serving dish if desired. Bake for 20 minutes. In the mean time, pan fry bacon on the stove until crisp. Remove and drain on paper towel. Remove baked potatoes from oven, sprinkle with shredded cheese. Baked for another 5 minutes to melt the cheese. 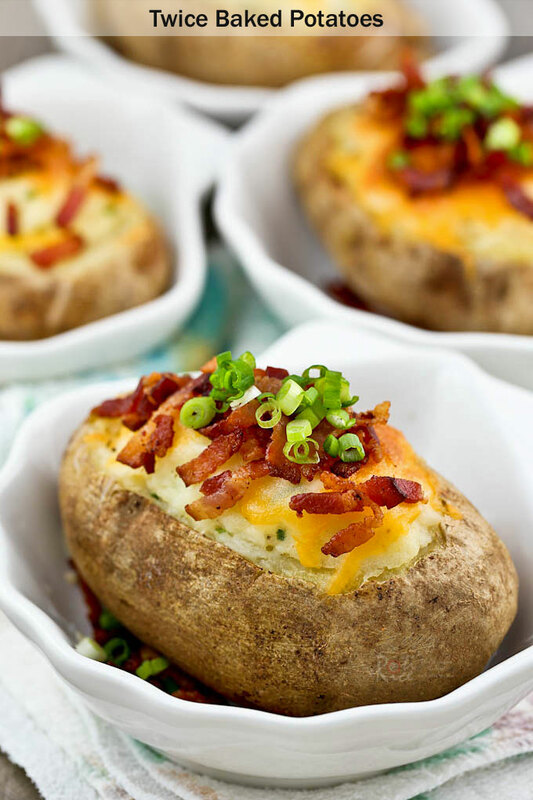 Remove twice baked potatoes from oven. Sprinkle with bacon bits and remaining green onions.